High quality contemporary acrylic signs suitable for internal or external use. These signs look crystal clean like glass and are ideal for a modern look. Apart from a wash occasionally no other maintenance is required. 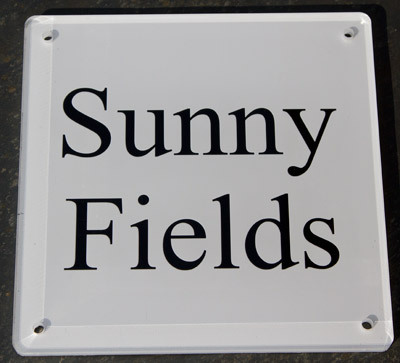 They can be used for house name plates, house signs, door number signs, or information signage. 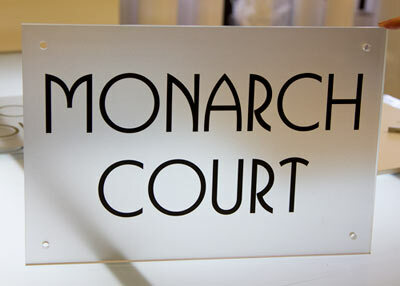 These house name plates also look amazing with a backing vinyl applied - either solid colour or sand-blast effect. 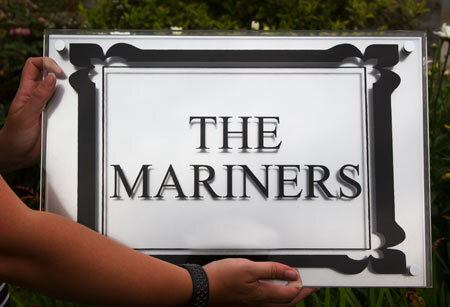 Click here for full colour clear acrylic house signs. The lettering is usually done in black but can be in almost any colour.This could be in white,cream or silver grey if the background is dark. We can also do in a sandblast effect. It is applied to the reverse of the sign and is therefore protected against vandalism. We have a large selection of lettering styles or fonts - to see the fonts - CLICK HERE Letter size is normally adjusted to suit the sign. The minimum letter size is 20mm. We can include pictures . We have a selection single colour standard images - Click here to see a variety of standard logos, symbols & pictures - or you can send in your own artwork - (Images for single colour work must be a clean silhouette style image without any very fine lines or shades) Cost £9.50 Use this design tool to help size and layout your clear acrylic house sign. At the press of a button you can send us your design to use for an order or a quote. Backing Vinyl An interesting and very effective alternative is to have a coloured vinyl applied behind the lettering. We can do this in blue or grey sandblast effect or a solid colour vinyl. The gold looks very classy - see below, white looks crisp and modern - see left. The house name plate to the right was created using the font Eurostar. It again had a white backing vinyl. This creates a very modern clean black and white nameplate. All these nameplates are supplied with good quality stand-off fittings. 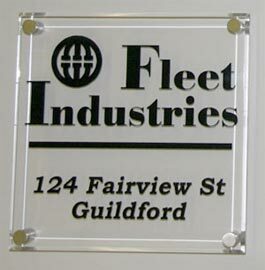 The clear acrylic sign on the left has black lettering on the back of a clear acrylic panel. A piece of silver aluminium composite has then been inserted 10mm behind using special stand-off fittings. 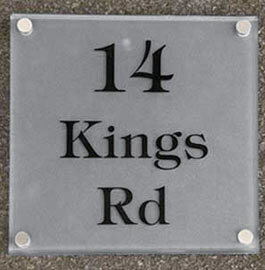 For this type of house name plate or for special sizes please email us for a quote. 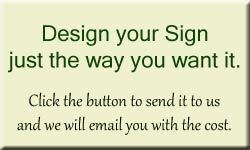 Most of our signs are sent by courier and a signature will be needed. We can send the parcel to your works address. Made in the UK. 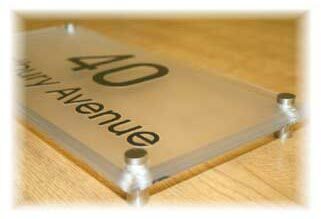 Our team at The Sign Maker looks forward to helping you with your clear acrylic name plate.